Typically the first item in each meal category is the restaurant's "anchor item," which is where they make their biggest profit. This could be pasta, seafood, salad, or more a generic category like "Entrees" or "Appetizers." Because the first item listed typically gets ordered more often than any other item in the category, it's going to usually be one of these anchor items. Buyer beware. Make sure to look through the entire list before you decide on what to order. Restaurants like to put meal categories in fancy boxes in different spots on their menus. It could be their steak dishes or maybe seafood dishes, but the one thing they have in common is they grab your attention and tend to make you more price insensitive. They want these boxes to grab your attention because typically their profit margin on these meals is the highest. To fight back, you'll want to ignore the boxes, avoid temptation, and stick to the meals in your budget. This is the old retail trick of having the price end just below a round number. Our eyes and brain are trained to read from left to right so the first number in the price is what we use to determine the overall value. A burrito selling for $7.95 just looks cheaper than one selling for $8.00. To fight back, just round the number up in your head, then decide if the price is reasonable. Restaurant menus are riddled with fancy words like "juicy," "creamy," "deep smoky flavor," and the like. They are designed and put on the menu for only one reason: to create hunger in the person ordering. It's like Pavlov's dogs, you hear the word juicy or tender and you start salivating immediately. By being aware of what restaurants are trying to do, you can gloss over the fancy words designed to create hunger pangs and order the meal you originally intended. "Chef Specials" are typically anything but. Instead, they're often meals that make the restaurant the most money or include ingredients the restaurant is trying to get rid of. The meal descriptions are usually full of fancy words designed to make you order them without much thought. They typically have their own special section on the menu with special fonts and graphics designed to catch your attention. The next time you see "Chef Specials" when dining out, don't fall for the trap. Instead, only order them if you were planning on it when you walked in the door. According to a Cornell study, diners tend to spend more at restaurants that don't use dollar signs on their menus. Because of this, high-end restaurants will often leave the dollar sign off the menu completely. Their thought process is that diners will be less likely to think about their own financial situation if the menu doesn't have dollar signs plastered all over it. Also, expensive restaurants will only use whole numbers for prices. For example, it could be a 29 or it could be a 14, in either case they want to remove the idea of real money from the situation. Thus you won't see any decimals, cents, or dollar signs on the menu. Be sure to consider what your meal total will be in "real" dollars before you place an order. Whether it's the Jack Daniel's BBQ sauce at TGIF's, or Doritos taco shells at Taco Bell, tying a brand-name to a meal (referred to as "co-branding") often gives restaurants the green light to charge you more. Don't fall for the mind game and instead look for cheaper alternatives on the menu that are almost identical. 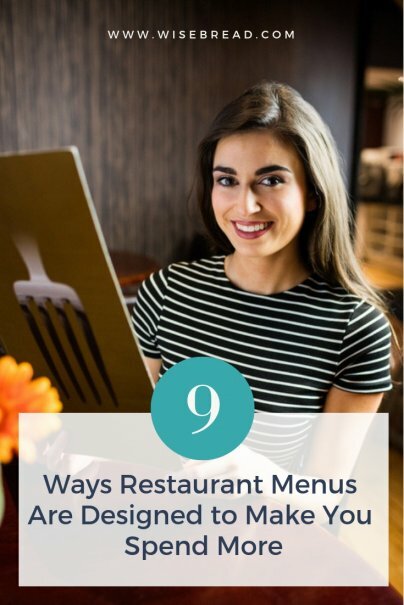 According to William Poundstone, author of Priceless: The Myth of Fair Value (and How to Take Advantage of It), diners tend to look at the top right corner of the menu first. This might seem a bit counterintuitive as we read from left to right, but Poundstone says this is where you'll most often find the restaurant's most profitable items. Thus, many restaurants will make this menu real estate stand out by using larger font, eye-catching boxes, and clever wording.